AMRO Constructions has been building top quality decks in Charlotte, North Carolina and the surrounding areas since 2004. We have amassed a large number of satisfied and loyal clients over the years. We are very proud of the fact our impeccable reputation precedes us. We guarantee that our quality, service, and professionalism is unmatched. Home owners are always searching for methods of increasing the value of their properties and year round functionality. 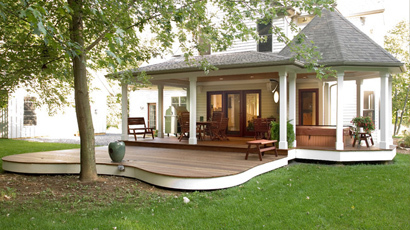 One of the most popular approaches is to install an outdoor deck. This is a wonderful place for family to gather for summer celebrations or to host block party events. There are all sorts of fabulous benefits of installing outdoor decks. Installing a beautiful deck in your outside living area provides a great deal of additional space for any type of gathering. This is helpful for summer time barbecues, birthday parties, and provides a lovely area to host dinner guest events. It also creates a place where the entire family can gather and lounge about in the sun on lazy days. 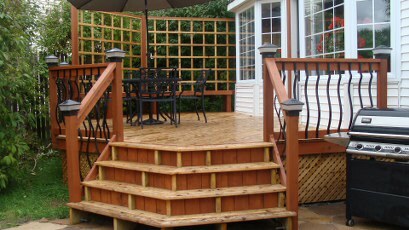 As mentioned above, installing an outdoor deck can exponentially increase the over resale value of your property. It is one of the major points home owners use to close the deal on the sale of their homes. Most all home improvement projects raise the value of the home; however, the ROI, or return on investment, is much greater than adding an additional bathroom or sun room. 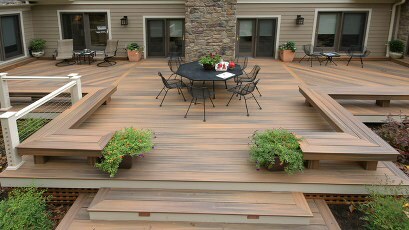 Installing an outdoor deck dramatically increases the aesthetic appeal and enhances the quality of any property. 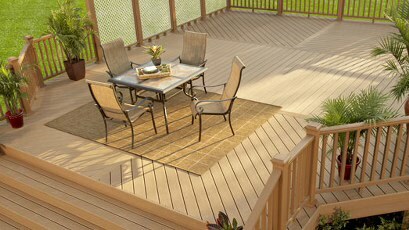 You have many design options to choose from in order to integrate the new deck smoothly into your current outdoor décor. A sealed plain wood deck adds elegant appeal, but you may also opt to stain it to match the trim and shutters of your home. 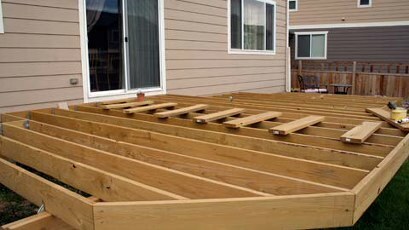 It takes very little time for a professional building contractor to install a new deck for your home. Since it is installed on the outside of your home the construction causes almost no disruption in your family’s day to day living. In many cases, our expert building team can be in and out of there in about a week. You and your family can be enjoying your gorgeous new deck in no time at all. Rest assured we will clean up before we leave so your property will as beautiful as it was when we arrived. While installing a new deck dramatically increases your property more than other home improvement projects, it also costs a great deal less. Many home owners find that they do not need to take out a loan to complete this type of home improvement project. 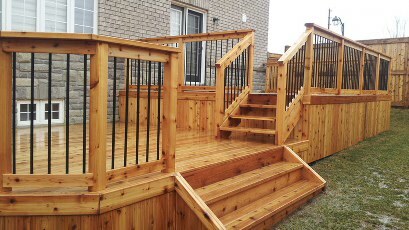 We would be happy to come to your home and discuss your deck building project. We only purchase high quality materials from outstanding and fairly priced suppliers to ensure your cost will be as low as possible. 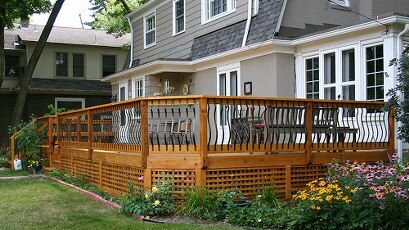 It is extremely important to the longevity of your deck that a professional builder installs it. 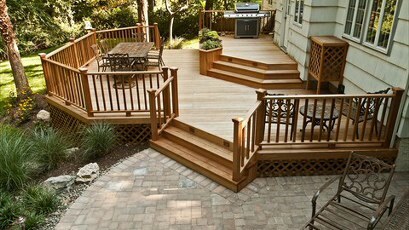 Our team at AMRO Constructions will start your new deck off on the right foot. We use only high quality, properly treated wood. We will also seal your deck to protect it from harsh weather elements. There are those which are called lifetime sealants. They are superior quality; however, none of them truly last for an entire lifetime, especially in harsh weather elements. The normal weather patterns in your area are the largest factor in how long your deck will last as well as how often you should have it resealed. The most common recommendation is to have your deck resealed every two to three years; however, that is not always enough. We are very familiar with the weather patterns in Charlotte, North Carolina and the surrounding areas. There are a couple items to keep in mind when setting a resealing schedule. Decks that are consistently in direct sunlight will often dry out and fade rater quickly. Decks within extremely humid areas, especially if the deck is in shade most of the time, cause wood to develop fungus spores and grow algae. Both of these types of issues should be addressed at least annually. Ideally decks in these weather conditions should be attended to biannually. This does not always indicate that the deck must be resealed every six months. We can help you set a maintenance schedule to suit your specific property. You can simply have your deck properly cleaned every six months and resealed annually. It simply depends upon your decks exposure. 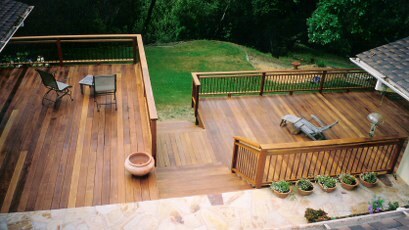 Prior to resealing your deck you should decide if it is time to re-stain it as well. Generally this should be done about every five years. Again, this greatly depends upon your local weather conditions. Keep in mind that this process cannot be completed in one day. Once we clean your deck it will need to dry for at least 24 hours before applying any type of stain or sealant. When we visit to clean, re-stain, and reseal your deck we will inspect it for any damage. It is extremely important to repair damaged wood as soon as possible. Delaying the repair could result in extensive wood damage or rot. In that case, it may be necessary to rebuild the entire deck. Routine maintenance and care usually prevents this and saves quite a bit of money. Decks or any structure made from wood begins to deteriorate in approximately three to six months, if left to the elements unsealed. AMRO Constructions has been providing professional building services for nearly 20 years. While we take great pride in the fact that we are a top ranked deck building company that is nowhere near all that we have to offer. We provide expert remodeling and renovation services as well. We can inspect your roof for minor damage repair or finish your entire basement for you. We would absolutely love to assist you in your next home improvement project. Call us now to schedule an appointment to discuss your family’s and property’s needs. We are only a phone call or click away.